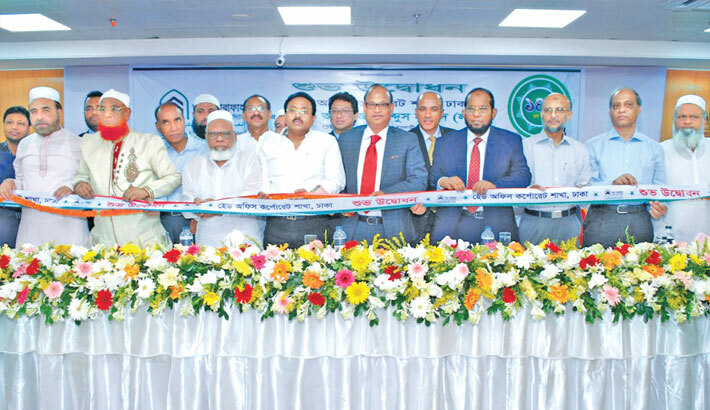 Al-Arafah Islami Bank Chairman Alhajj Abdus Samad (Labu) inaugurates the head office corporate branch of the bank at AIBL Tower at Purana Paltan in the capital on Thursday. Al-Arafah Islami Bank has opened its 141st branch at AIBL Tower at Purana Paltan in the city on Thursday. The new branch named Head Office Corporate Branch was inaugurated by Alhajj Abdus Samad (Labu), Chairman, Al-Arafah Islami Bank, said a press release. Managing Director Md Habibur Rahman presided over the opening ceremony while founder Chairman Alhajj AZM Shamsul Alam, directors Badiur Rahman, Alhajj Md. Harun-Ar-Rashid Khan, Alhajj Nazmul Ahsan Khaled, Alhajj Abdul Malek Mollah, Alhajj Hafej Md. Enayet Ullah, Alhajj ANM Yeahea, Engr. Kh. Mesbah Uddin Ahmed, Alhajj Niaz Ahmed, Alhajj Md. Anowar Hossain, Alhajj Md. Liakat Ali Chowdhury, Alhajj Salim Rahman, Md. Amir Uddin PPM were present. Deputy Managing Director Kazi Towhidul Alam delivered the welcome speech. Chairman Alhajj Abdus Samad (Labu), in his speech, said Al-Arafah Islami Bank was established not for making profit by doing business but for the welfare of the society. He invited all to have the blessings of Islamic banking service in the new branch.